An analysis of Augustine’s writings on speaking in tongues. Augustine wrote a considerable amount on the subject which first appears to be an open and shut case, but a closer look reveals a diversity of thought propelled by political influences. The conflict with the rival Donatist movement gives one of the earliest and extensive articles of tongues speech in the church. His coverage dispels the notion that the institutional church after Pentecost had quashed or ignored the christian rite of tongues. The theories on speaking in tongues during Augustine’s time. 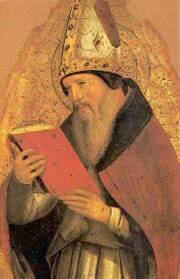 Augustine, Bishop of Hippo, 354-430 AD, was likely aware of the different theories on the subject. His contemporaries Gregory Nazianzus (329 to 390 AD) had posited that there are two options for the Pentecost outburst of tongues: it was either a miracle of hearing or of speaking, and more likely the latter. John Chrysostom (349 to 407 AD) held similar views to Augustine on the diminished role of divine tongues in the individual expression. An earlier North African leader named Pachomius (292 to 346 AD) was mythologized as having been divinely enabled to temporarily speak Latin. The first century BC Jewish Hellenistic philosopher, Philo of Alexandria, didn’t write about the gift of tongues, but he did cover the mechanics behind God speaking. He held that when God spoke it was in a sound that would implant in the hearers mind, bypassing the ears, being beyond human language. Was it a miracle of speaking or hearing? Sometimes he favored the miracle of speaking while others times of hearing. He does tend to allude to the idea of the miracle of one voice emanating and the hearers miraculously hearing in their own language. There is no question that the semantic range of this experience fell inside the use of foreign languages, nothing more. He used the term linguis omnium gentium “in the languages of all the nations” on at least 23 occasions, and linguis omnium, speaking “in all languages”. Neither does Augustine quote or refer to the Montanist movement in his works. Augustine on the question, Should everybody speak in tongues? The gift of tongues changed from an individual to a corporate expression. The last one brings on an important theological perspective by Augustine on the doctrine of tongues. The gift being expressed through individuals has died, and now has been transferred to and operated by the corporate Church. More of this doctrine can be found in the next article, Augustine on Tongues and the Donatists. What did Augustine intend? I have never seen in any Patristic literature where a church leader made a complete and concise reversal or retraction of a theological concept. This may be the closest that Augustine could achieve without having amassed some percieved shame or criticism of his legacy. A complete avowal would also have legitimized the majority Donatist movement whose emphasis on the gift of tongues symbolized their fidelity. Augustine spent decades in theological dispute with them on that very subject. It is no surprise when he stated that miracles still occur, but some do not, he listed the individual speaking in tongues as the first example that is no longer utilized. This is in keeping with his various polemical assaults against the Donatists. A specialist in Augustine, Prof. Jan den Boeft, considers the Retractiones text wanting. He thinks that Augustine is referring to the cessation of only a few miracles including speaking in tongues while most continued.13 Prof. Boeft makes a proper connection between Chrysostom and Augustine on the de-emphasis on miracles whereby miracles were considered unimportant in the development of christian character and often antithetical. The penchant for miracles was considered a gateway to pride. Chrysostom had shifted the element of miracles away from the individual and moved the practice to the rituals and symbols of the corporate church and the cult of deceased saints. See Chrysostom on the Doctrine of tongues for more information. Augustine on the tongues of Corinth. There was not found in any of his writings a theological analysis about the problem in Corinth. He does refer to I Corinthians 13:1 “If I speak in the tongues of men and angels…” over eight times. This appears to be a popular verse used by him in his argumentation against his Donatist rivals. He used this passage to emphasize brotherly love over ambition. The neglect of Augustine on this subject. It is surprising that his works have not entered into the primary source books as a central author explaining and defining the christian tongues doctrine. This problem is not unique just to Augustine. This is covered in more detail at the following article: Examining the Source Books on Glossolalia and Christian tongues. It is also vexing how many of his works, which includes the tongues-passages, do not have popular English translations. He is one of the foremost writers who has withstood the test of time. One of only a handful of authors of any genre has managed to do that. If his works were more widely available in English, it would have changed the dynamics of the discussion over the last century. His works are well written and thought-out with an easy-to-read style which most readers will come to appreciate. Is Tyrannius Rufinus a Reliable Translator?